What do you do if your muse comes to call unexpectedly, during your trips and on vacations? Can you make her hold on for a while? Is it comfortable to carry your heavy and bulky laptop with music notation software permanently? Now you can combine your favorite work and rest, compose and arrange music everywhere, whenever you want! MagicScore OneTouch Composer is the first music notation software for Windows tablets all over the World. Compose music with OneTouch Composer – the best software for Windows 8 tablets due to Intel Application Innovation Contest. OneTouch Composer was developed on the basis of the popular music notation software – MagicScore Maestro. It was declared the world’s best music notation software due to most popular independent review by TopTenReviews. OneTouch Composer is the best solution for almost any musicians, from amateurs and students to teachers and composers. The program includes the most demanded features of MagicScore Maestro. Moreover, OneTouch Composer is a very easy and extremely comfortable in use. Using OneTouch Composer, you can easily compose, arrange, print, publish in web, learn and teach music. Just a few touches … and you have made a piece of music already! Of course, you can listen to the music as you write it! Some music software products have a short learning curve, some long… OneTouch Composer doesn’t have it at all! With OneTouch Composer, you will have everything at hand. Run the program and do what you want. All required tools are on the main window. 3. Availability of all functions from the main window in one touch. Powerful functionality is used easy and naturally. OneTouch Composer provides you with a very simple interface, and, at the same time, you have everything you need for your work, study, teaching, creativity and rehearsals. Cutting-edge technologies and intuitive, user friendly, interface will help you to get the perfect results fast and easy. Your score will look great and your music is going to be even greater! 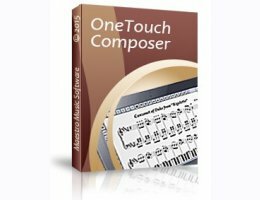 OneTouch Composer includes export to PDF, MIDI, MusicXML and Karaoke formats. The program offers possibilities to publish live printable and playable musical scores on your website, using free MagicScore Online plug-in. Built-in help system is very useful in getting started with all MagicScore products. With OneTouch Composer you may just express yourself in music. You won’t waste time mastering this software. Still, OneTouch Composer includes help materials, and you also can get to the Online Learning Center in two clicks. Finally, OneTouch Composer provides you with free technical support.